When Pat Noonan moved into her Hamburg home in 2011, the yard was totally bare. Noonan, now 88, was at a point in her life when some people give up gardening. And at any point in your life, starting from scratch on a landscape can be daunting. But with help from neighbors and relatives, she now has a landscape that she enjoys. 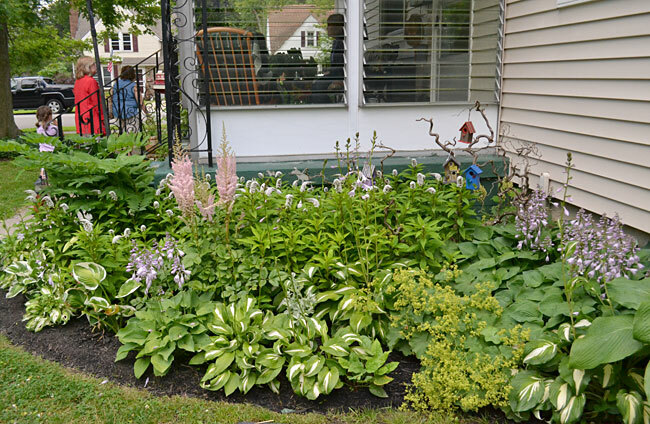 She shared her garden on the Hamburg Garden Walk on Saturday and Sunday, July 8 and 9 this year. Noonan offered great tips that can help if you’re facing an empty landscape. Her tips are also helpful for someone who wants to continue gardening, but feels as if it might be too much for them as they get older. While Noonan has a large front yard, the exciting stuff happens in a smaller area around the back porch. “This is as much as I can take care of,” Noonan said. And since she spends a lot of time on the porch, that’s the area where she decided to invest her time and energy. Takeaway: Develop the part of the landscape that is most important to you. Perhaps it’s an area around the patio or the part of the yard you see most when you’re looking out the window. Do what pleases you. “Gardening keeps me going,” Noonan said. “It gets me out with people. It’s been a big thing in my life. She gets help from her grandson, Josh Smith, landscape manager for PUSH Buffalo, and also has someone mow her large front lawn for her. Takeaway: For most of us, gardening is just a hobby, so enjoy it! If you have a busy life, squeeze in gardening when you have time– don’t wait until you’re retired to start. And if you find you can’t do as much as you used to, it’s okay to cut back. Also consider getting a company to do the tasks you can’t do or don’t want to do. 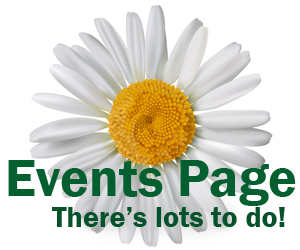 (See our Gardening Directory.) Just relax and have fun! Noonan got many of her plants from her neighbor, Molly Mailey, who has a mature garden with many perennials. And they both pass plants along to friends as well. “It makes it a nice neighborly situation,” Noonan said. Takeaway: If a perennial grows well in a neighbor’s yard, it will probably grow well in your yard. Perennials spread, and it breaks a gardener’s heart to throw extra plants on the compost pile. 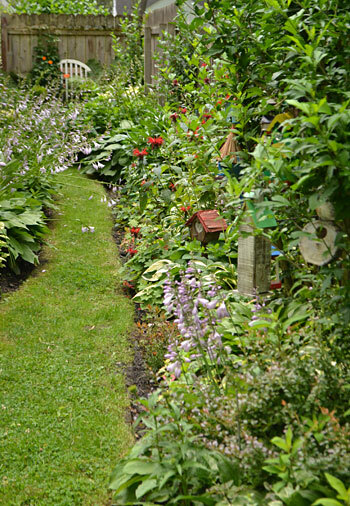 Ask the people who live near you about their gardens. You can get some great advice and maybe even some plants. Plus it’s a great way to meet the neighbors. In one garden bed, Noonan has several large pots planted up with annuals. Her selections are different every year. Takeaway: Shop around. Our local garden centers vary in their selection of plants. You may find something new and different that you really like. 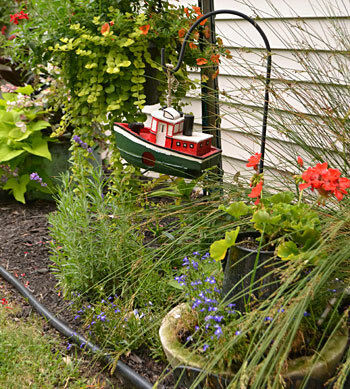 Noonan’s husband Vic, who died in 2011, had worked with the Great Lakes Towing Company, and you’ll see references to that family tradition of working with tugboats throughout her garden. Vic’s grandfather, father, uncles and cousins worked in the business, as did the couple’s son. Vic’s grandfather received the Congressional Life Saving Medal in the late 1800s for rescuing people from flooding in their small homes at Times Beach at the foot of Ganson St. in Buffalo. That was before the breakwall was built, Noonan said. When the St. Lawrence Seaway was built, there was less need for tugboats here, and Vic and one of his cousins were the last full-time employees. “Everything here has a story,” Noonan said, pointing to dozens of birdhouses. They were gifts from a brother or a cousin or a neighbor or a friend. Some were made by grandchildren or great-grandchildren. Each holds a memory. Takeaway: You don’t have to make your garden look like someone else’s garden. Let your garden be an expression of what is dear to you. Yes, everything has a story. I really like what she said about this. In years to come I hope to tell people about the large rocks, headstone and other rocks in my yard. Some were quarried in 1850 nea4 Albion NY while others came from my childhood home. Each one has a story and there are several different types of rocks with some native to WNY. Thanks for the article Connie! 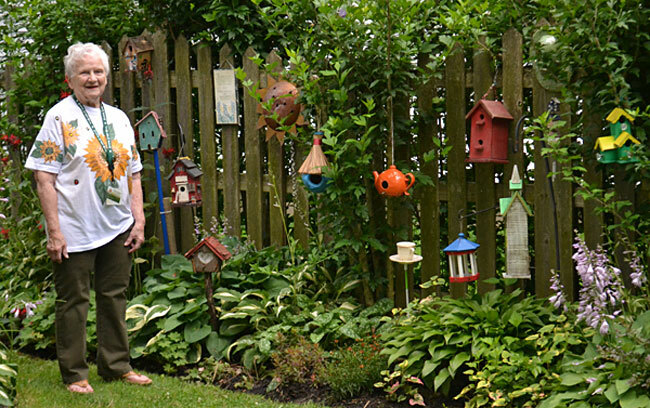 Pat your garden is lovely, thanks for sharing with us. Martha, that’s so interesting! Thanks for sharing! What a great article. Although I’m ‘only’ 69 I often wonder how I’ll take care of my gardens in later years. I try to stay healthy, work out on a regular basis, but I know how quickly circumstances can change. I’ve decided that in my retirement (7/1/17) I’d like to help other gardeners like Pat keep gardening. If anyone is interested in volunteering along with me, has any ideas as to how we can do this, please contact me. 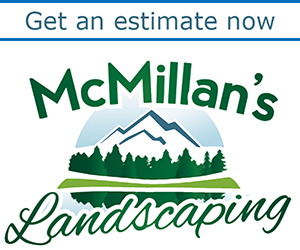 I’m thinking 1 or 2 days a week I could help out with trimming, planting, weeding, etc. Margaret, what a lovely idea. It sounds as if it would fun for everyone involved. Getting it off the ground sounds like the hard part. If you can’t find anyone who needs this help, you might contact a garden club or a community garden. Many garden clubs help to maintain public gardens, and you might find that fulfilling. Community gardens often need help, too. You could contact Grassroots Gardens for more information. Best of luck.